Also, I finally got an “S” rank for a Mat date! This is from date 2 and I played it right after I finished that last post where I said his dates were hard. I stand by that, but I guess they’re getting easier? Or that first date minigame is just that brutal. Ok, top 3 dads plus some thoughts on background characters. Ready? Let’s go. Ugh, Brian. I like Brian, I really do. And I think he’s a really good match for the player character and in some ways even seems set up to be THE match (despite the masses of players going right to Craig). You get the most character development if you choose this path. They’re very much mirrors of each other, their kids get along great, and the player character has a lot of deep insecurities that don’t really seem to get resolved quite as well with any of the other dads. So it seems like a no-brainer. But then in other ways, it seems like the game is just begging you not to go down this road and discouraging you at every turn. You have to be unreasonably competitive with Brian. It doesn’t matter that Brian is a perfectly friendly guy, there are no options to just respond in an equally friendly way and be supportive instead of competitive. Your character hates Brian, it’s settled. And it’s so bizarre and out of nowhere, too. At no point are you like “whoa, Mat knows too many things about music, I have to prove I know just as much because he’s clearly only talking about this to one-up me.” You are literally only this competitive weirdo when you’re with Brian. My first playthrough, my “legacy” playthrough kind of, I was torn between Hugo and Brian. I actually kind of liked Hugo better and did a *tiny* bit better on his dates, but I went with Brian so I’d never have to sit through those awkward “NO, MY KID IS BETTER” conversations again and could just see the whole storyline in this one go. Your first chance to meet Damien is in a certain goth store at the mall, and he does not make a good first impression. With nothing else to go on, I kind of figured he must be a joke character and wondered if anyone would actually pick him. Then I went on one of his dates, just for fun after I’d finished with my favorites. AWWWW. Damien is perfect and beautiful and his dates are so fun. 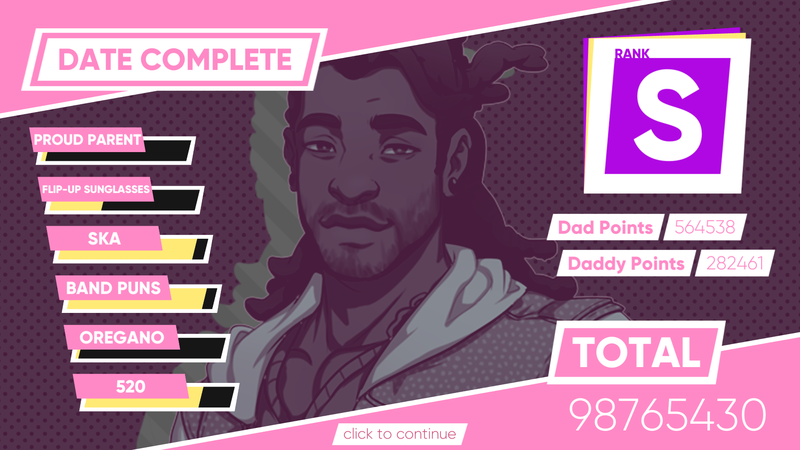 He is also the other canon trans dad, which is neat but a very minor point in his storyline and definitely not the most interesting thing about him. He’s obsessed with Victorian aesthetics and culture and vampire tropes and his house is SO cool and the second and third dates just get progressively sweeter and cuter and it’s wonderful. He’s weird and I think I might find him awkward to be around in the real world, but I love that he owns his weird and is so completely dedicated to the things he enjoys. Awesome character. I think Hugo has the closest personality to mine. His dates were really easy and natural, very little thought required to pull off those “S” ranks. Our interests and styles are different, but we are similar in the ways we pursue them and our general quiet/polite behavior (with a hidden jerk side). 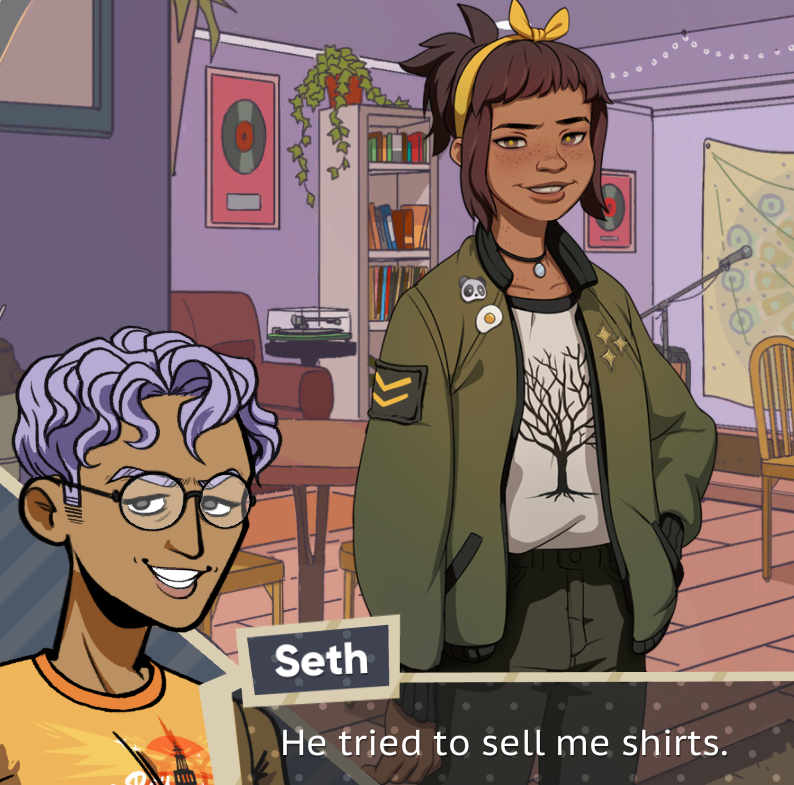 So I like playing his dates and learning more about him, and I always feel like the dates are going well and my character is hitting it off with him more than with the others, so that’s nice. Regardless, if I ever make a Dream Daddy neighborhood in The Sims, Ernest is definitely getting a dog. Oh wow the kids are great. All of them, even Ernest. He can be kind of a pain but he gets some great lines and I love his friendship with Lucien (Damien’s kid). I really do kind of want them to be step-brothers. Daisy is Brian’s kid, a 10-year-old who reads BIG books and doesn’t fit in with kids her own age so doesn’t have any friends. She also doesn’t know how to play pretend. In other words, she’s me at that age! 😀 I read her as being autistic, so there’s that added representation too. She and Amanda get along really well and I love seeing them together, which definitely made the Brian dates more fun. Joseph and Mary’s kids: Chris, Christian, Cristie, and Crish. 😀 It’s so ridiculous, I can’t. But the twins are pretty fun. RIVER. And also Craig’s twins. But RIVER. Craig, you should not be throwing a softball around with a baby strapped to your chest, what is wrong with you? Also no jogging that way, get a running stroller, sheesh. But she’s adorable and I like that she’s always with him. I wish there was more of Carmensita. She’s cute and I love the bit where she makes a flower crown for Mat, but she doesn’t seem to get nearly as much screen time as some of the others and I want to know more about her. Mary is a beautiful badass angel. Pablo is hilarious and awesome and I really hope his t-shirt business takes off. They’re all a lot of fun. All done now. 😀 Here’s my second dadsona with Amanda! They’re talking about Pablo.